Christmas Tourtiere . . .
Quebec has two basic tourtieres, and many variations for each type, gastronomy historian Jean-Pierre Lemasson told the McCord Museum conference. There is the shallow style, filled with pork and/or other meats, and a deep-dish Lac St. Jean, or Saguenay, style that contains cubes of meats with vegetables. Marcus Gavius Apicius, credited with writing the recipes in what is believed to be the first cookbook (about AD 400), gave us what might be the earliest written recipe for the deep-dish version, he said. It's a pie called La Patina that was made in a bronze pot with four layers of pastry, the top crust with a hole in the centre. Medieval predecessors of the tourtiere described by Lemasson include Italy's tourte parmesane, pasticchio, timballo, and timpanno. France has a tourte parmenienne, he said, followed by the timbale and the casserole. British meat pies included the Parmesan and Battle Pye, the raised pie, and the Yorkshire Christmas pie. Some of these early pies were elaborate, said the professor, who is French-born but enjoys a Quebec-style tourtiere (see recipe below). The Italian tourte parmesane, described in a recipe from about 1350, was a six-layer pie that included dates, chicken, cheese, sausages, ham, ground pork and almonds. The Lac St. Jean tourtiere resembles Quebec's cipaille or cipate, Lemasson said. He traced its name to sea pie or six pie, citing a recipe from the first U.S. cookbook, American Cookery, published in 1796 in Hartford, Conn., by Amelia Simmons. Lining her pot with pastry, she layered in pigeon, turkey, veal, mutton, pork, and salt and pepper. Adding water to moisten the mixture, Simmons covered the mixture with pastry and cooked it for a couple of hours. Here is Lemasson's family recipe for the shallow, ground-meat style tourtiere. Lemasson enjoys this recipe, prepared by his daughter Carine Lemasson-Boulanger, using her mother-in-law's recipe. 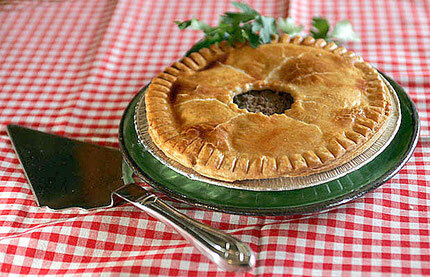 The pie is a traditional pork version, veal optional, flavoured with onions, garlic, herbs and spices. Serve it with pickled beets, a traditional Quebec accompaniment. * Ground veal or half-and-half pork and veal may be used. Using a medium, heavy saucepan, combine pork, onion, garlic, salt, savory, celery pepper, cloves and water. Bring mixture to a boil, cover, lower heat to low and simmer for 20 minutes, stirring occasionally. If mixture is too moist, stir in bread crumbs to thicken it. Line two pie pans with pastry. Divide meat mixture between the two, spreading evenly. Top each pan with pastry, pinching the edges to seal. Cut tiny slits in the top crust. Bake in oven preheated to 425 degrees F (220 C) for 15 minutes, then lower temperature to 375 degrees F (190 C) and bake another 25-30 minutes or until the pastry is crisp and golden brown. Serve hot.